Above: Snow blankets the UT campus in front of the old Main Building. Snow days in Austin are rare. When Old Man Winter makes an infrequent visit to the capital of Texas, it usually closes down both the city and the University. But UT’s first snow day depended on some daring acts by a few students, and a University president with a sense of humor. In February, 1899, an exceptionally strong Arctic surge abruptly disturbed an otherwise quiet winter across most of North America. 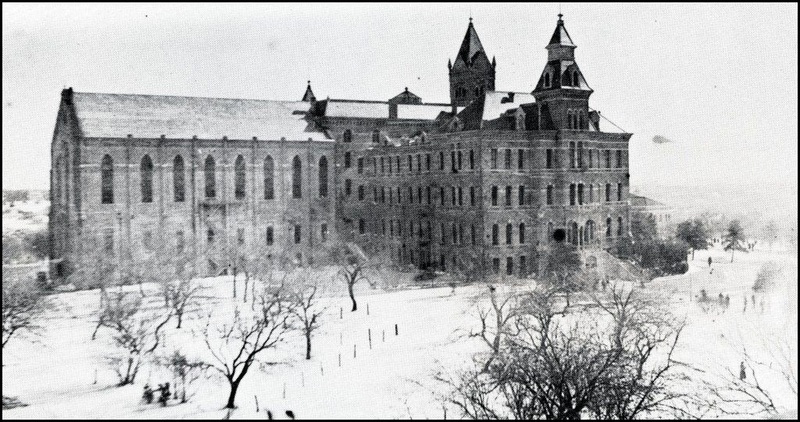 Dubbed the Great Blizzard of 1899, it brought record cold to the South, including a -1ºF low temperature in Austin. More than 35 inches of snow fell in Washington, DC, and white-out conditions were experienced as far south as Tampa, Florida. It was also a class day. For the first few decades, University classes met six days a week, either on Monday, Wednesday, Friday or Tuesday, Thursday, Saturday. Since most of the faculty and UT’s 600 students lived on or within walking distance of the campus, and as there was no radio, television or internet to broadcast a school closure, Saturday classes began as usual, promptly at 9 a.m. 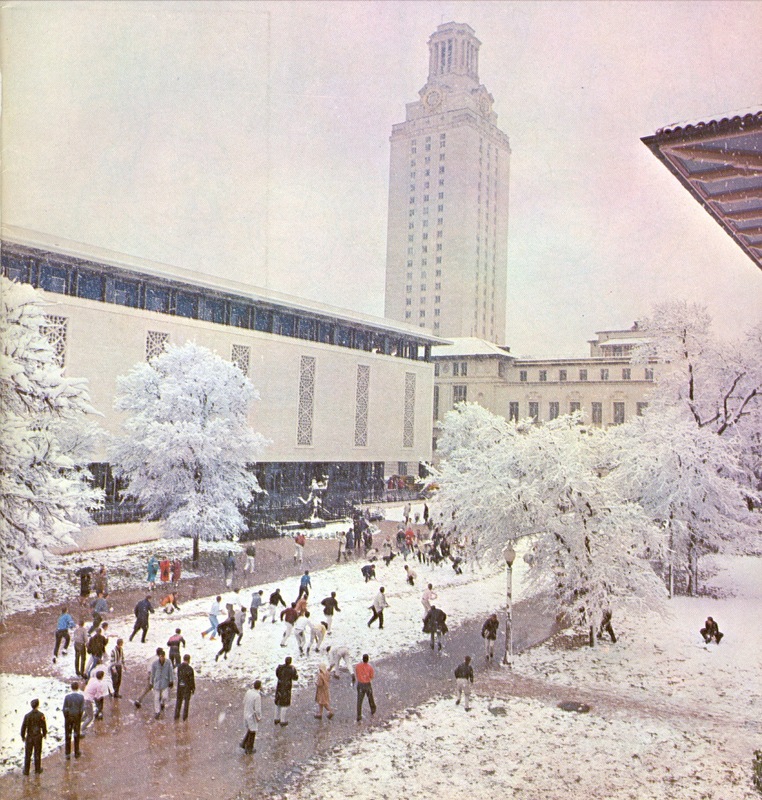 Above: A side view of Old Main and a snowy Forty Acres. The photo was taken the same day as the one at the top of the story. Of course, the snow was a distraction. Students gazing from the windows of the newly completed Main Building (better known as “Old Main,” and since replaced by the current Main Building and Tower) couldn’t help but think that such an unusual day ought not to be spent in a classroom. The denizens of B. Hall agreed. As the snow fell, so fell their interest in academic work. Schemes hatched in the minds of the Hall’s residents as snowballs formed in their hands, and gradually a relationship of cause and effect between the two was realized. 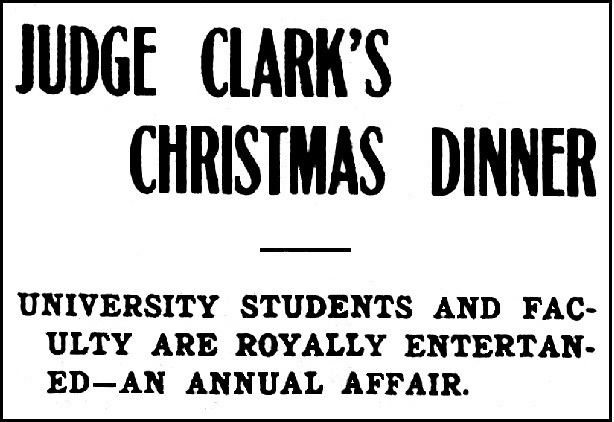 The only piece missing was the official declaration of a holiday, which could only be granted by the University president. The mob of students squeezed into the president’s office, where Schreiner and Monteith, respectfully, but firmly, presented their request for a day off. Winston eyed the students, spied the arsenal of snowballs, but didn’t panic. He’d been in this situation before. George T. Winston (photo at left) was appointed UT’s first full-time president in 1896, succeeding Leslie Waggener, who was then both Chairman of the Faculty and President ad interim. 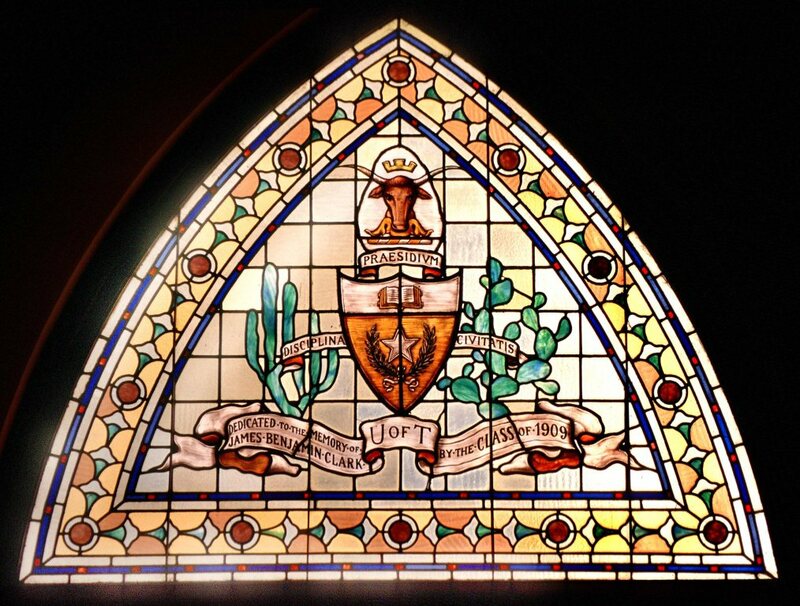 In the spring of 1897, Winston received a request from the students who believed that March 2nd, Texas Independence Day, should be an annual University holiday. But Winston hailed from North Carolina, had attended the Naval Academy and Cornell University, and neither understood nor shared the affinity Texans had for March 2nd. He flatly refused the petition. The only Independence Day he recognized was on July 4th. The news wafted through the halls of the Old Main, classrooms were opened, “and the prisoners liberated.” The only dissenting voice came from English Professor Mark Liddell, who was unhappy at the interruption of his lecture. Though he may have been a bit warm under the collar, his temperament was surely cooled as a volley of snowballs was fired in his direction. The rest of the day was spent in a great snowball battle in which the residents of B. Hall held their own against the combined forces of the remaining students and faculty. Above: A snowball fight of a later day. A fierce battle breaks out on the West Mall after a snowfall in the winter of 1963. Click on image for a larger view. All Hallow’s Eve has once again arrived in Austin. Ghosts, witches, zombies, and other ghoulish creatures will soon wander the neighborhoods, plying their trade in search of sugary treats, or gather by the thousands on Sixth Street for some late night revelry. Such was not always the custom. “Trick or treating,” as a modern tradition, has only been around since the 1930s. 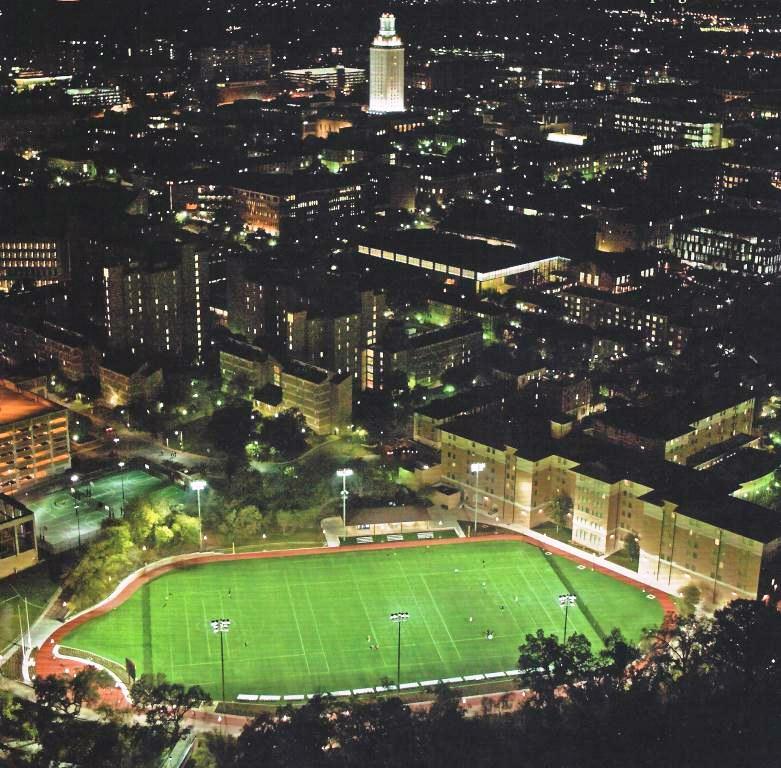 A century ago, Halloween in Austin usually meant mischief, at least for those living near the University of Texas campus. A favorite practice was the mysterious disappearance of items, from yard decorations to signs to delivery wagons, which were quietly spirited away overnight, only to reappear somewhere on the Forty Acres, waiting to be reclaimed by their owners. On Halloween night 1906, about a half hour before midnight, engineering sophomore Alfred “Alf” Toombs entered the north door of B. Hall on the ground floor. B. 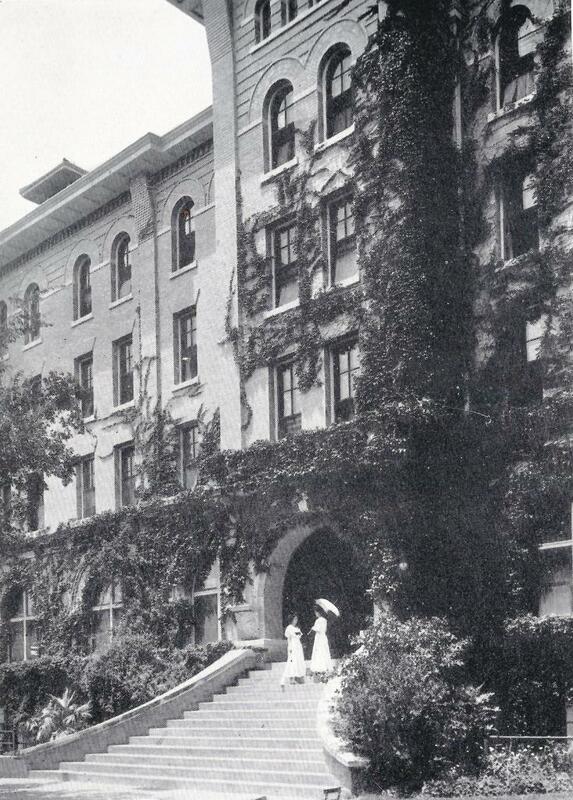 Hall (photo at right) was the first men’s dorm on the campus, and the bottom floor housed both the kitchen and dining room. At the late hour, the room was dark, but as Toombs pulled on the door handle, there was some resistance. At first he thought he’d encountered a fellow student leaving the building at the same time. 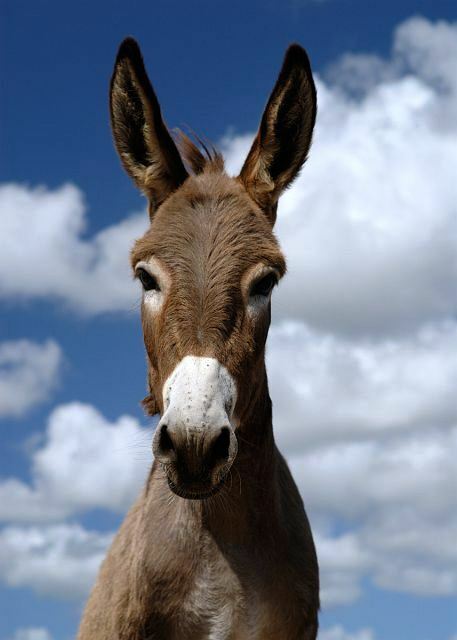 Instead, Toombs discovered a donkey hitched to the doorknob on the inside. The animal belonged to Mrs. Carothers, head matron of the Woman’s Building (the women’s dorm), and was the pet of her two children. Evidently, the donkey had been kidnapped from his stable and was an unwilling participant of some Halloween shenanigans. Above: B. 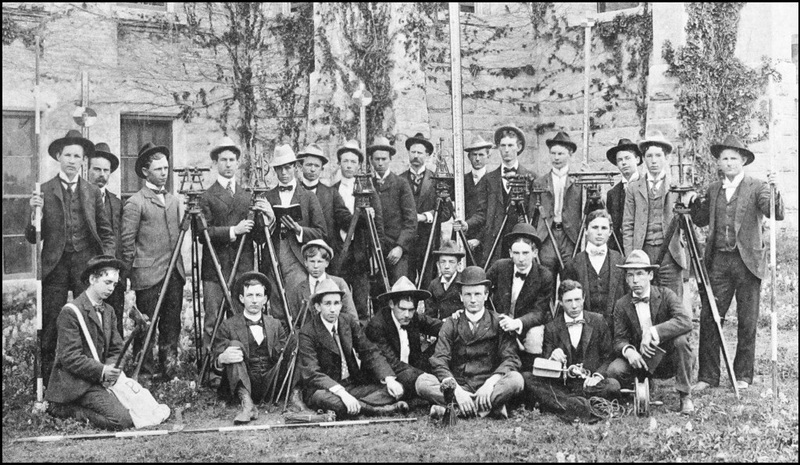 Hall residents pose for a group photo. Some of Toombs’ cohorts voiced doubts that the donkey could be persuaded to climb the fourteen steps at the entrance to the building to reach the vestibule. To make sure the animal was ready, the group decided to first “rehearse” on the steps of the Engineering Building (today’s Gebauer Building), and then walk across campus for the final performance. 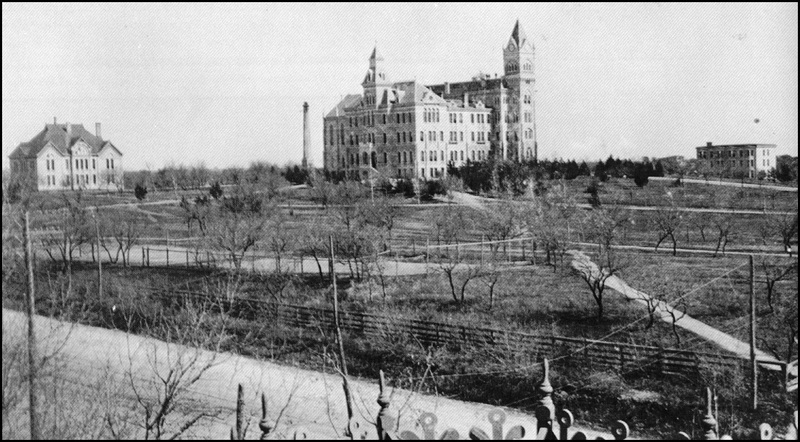 The campus in 1906. B. Hall, the men’s dorm, is on the far right, while the Woman’s Building, placed as far away as possible across campus, is on the left. The Engineering Building (today’s Gebauer Building), is just to the left of B. Hall. With plans made, a group of six B. Hallers led the donkey out of the dorm to the Engineering Building, a short walk to the northwest. With a little pulling, pushing, and half-lifting, the animal climbed the steps and demonstrated his abilities. The students led the donkey back down again, and started out for their goal. Along the way, the group met up with Gene “Deb” Debogery, a genial fellow denizen of B. 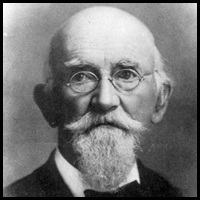 Hall who called himself the “East Texas Crow” because of his frequent, raucous “cawing” in imitation of the species. Debogery was also an avid baseball fan, though not as good a player. He was often found in front of B. Hall playing catch with someone, and at the same time either endangering the health of fellow students walking to classes, or breaking windows in the hall. On this occasion, Debogery had been out celebrating the evening and “was fairly well organized,” according to Toombs. Deb enthusiastically volunteered to help, though the rest of the group quickly realized that any chance of quiet had been lost. Unlike the rehearsal at the Engineering Building, the donkey was far more reluctant to climb the stairs of the women’s dorm (photo at left). After several attempts, the group resorted to lifting the animal’s front two legs completely off the ground and pulling on a long rope which had been passed behind the donkey’s back legs. Subtle it wasn’t, but the job was completed and the vestibule was reached. But once on the top step, Deb discovered that the latch to the front door was unlocked, and soon insisted that their charge be taken inside and tied to a stair post. To pacify Deb, the others put him in charge of the task. The reluctant donkey was pushed inside to the spacious front lobby of the Woman’s Building, but the clatter predictably woke some of the residents. A light appeared at the top the stairway, and the commanding voice of Mrs. Carothers soon followed. “Who’s there? !” she demanded, “And what are you doing?” A few tousled heads poked out over the banister, and one belligerent maid let fly a hairbrush at the intruders. One of the men answered that they’d brought another boarder, to which Mrs. Carothers retorted that the dorm was full. No matter. The donkey was secured to the stair post and the group quickly decamped. The evening’s adventures were not quite complete, however. As the B. Hallers made their escape out the front door of the Woman’s Building, they were confronted by the University’s night watchman who had witnessed the whole escapade. He retrieved the donkey, led him easily down the stairs, and told the students that the animal would be secured to prevent further antics. The watchman intended to place the animal in the new band house, a makeshift structure set up under the campus water tank as a place for the University Band to rehearse. 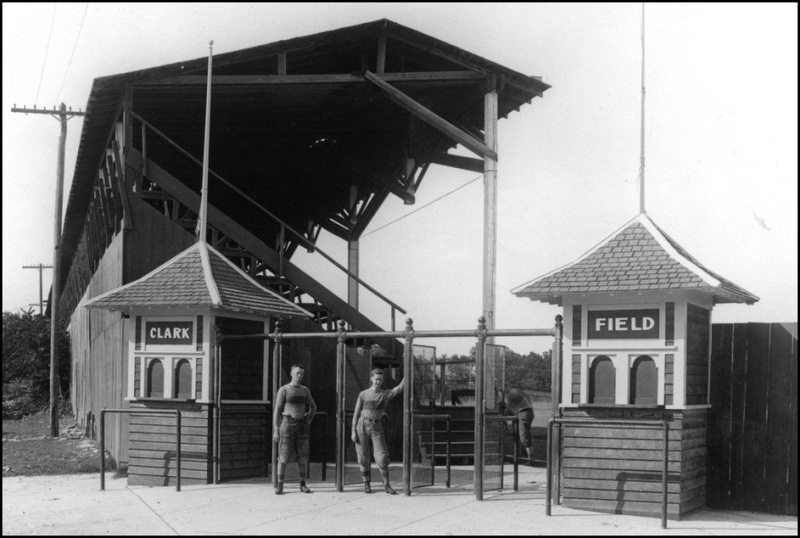 Above right: The old water tank, placed on the north side of campus (about where the Painter Hall parking lot is today), with a temporary band hall installed at its base. The University Methodist Church and Littlefield Home can be seen behind it, with 24th Street heading downhill to the right. Click on an image for a larger view. The donkey, by now tired of being led around, refused to enter the darkened confines of the band room outright. “We’ll help!” volunteered the B. Hall contingent. Unaware of the trap that was being set, the night watchman agreed, and pulled the animal from the front while the group pushed from behind. Of course, once the watchman and the donkey had entered the band house, the door was quickly closed and padlocked. The two spent the rest of the night together, mourning their plight and leaving the campus unprotected. or, What the Fulmore School gave to B. Hall, and vice versa. The Fulmore bell safely resides in the courtyard of the school. 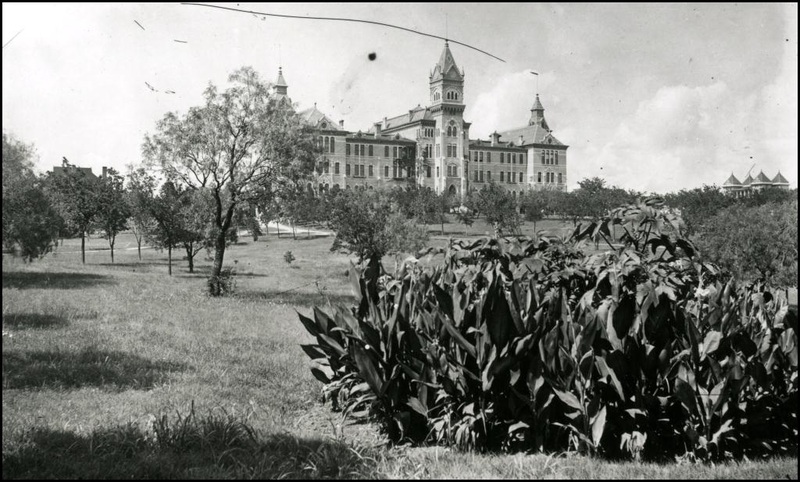 It was the final day of November 1911, as a chilly, peaceful, lazy Thanksgiving morning dawned on the University of Texas campus. 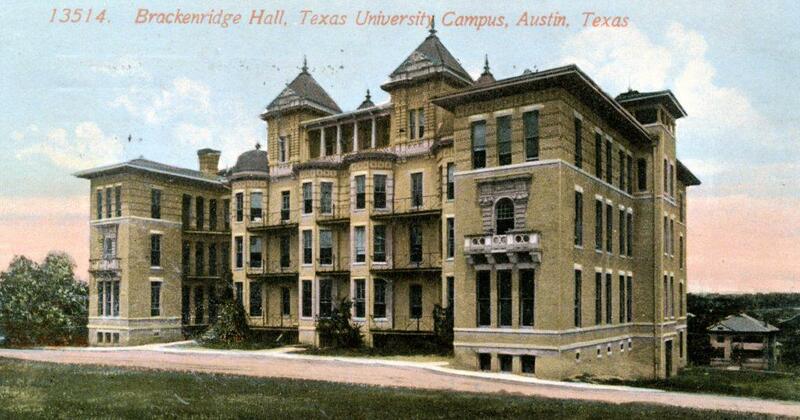 The only holiday of the fall term, most of the residents of Brackenridge Hall – or B. Hall, as the men’s dorm was called – expected to enjoy some extra sleep. 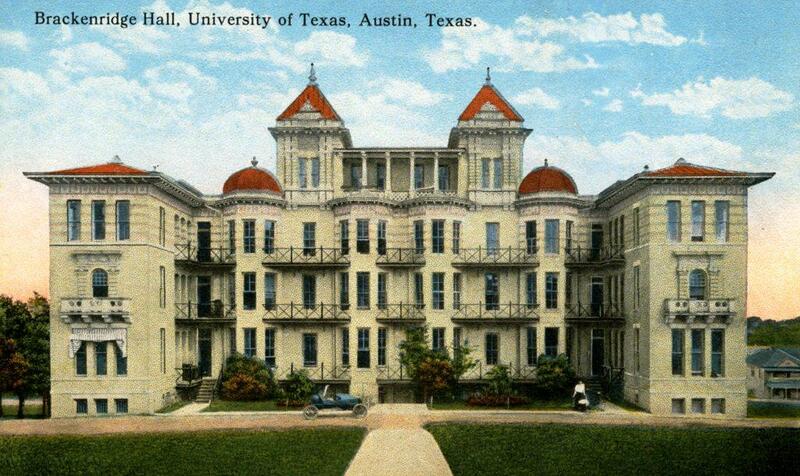 An inexpensive residence hall intended for the “poor boys” of Texas, B. Hall’s inhabitants didn’t possess many luxuries, and that included alarm clocks. For years, in order to wake everyone in time for breakfast and class, a designated bell ringer strode through the hall with a cowbell promptly at 6:45 a.m. every morning. 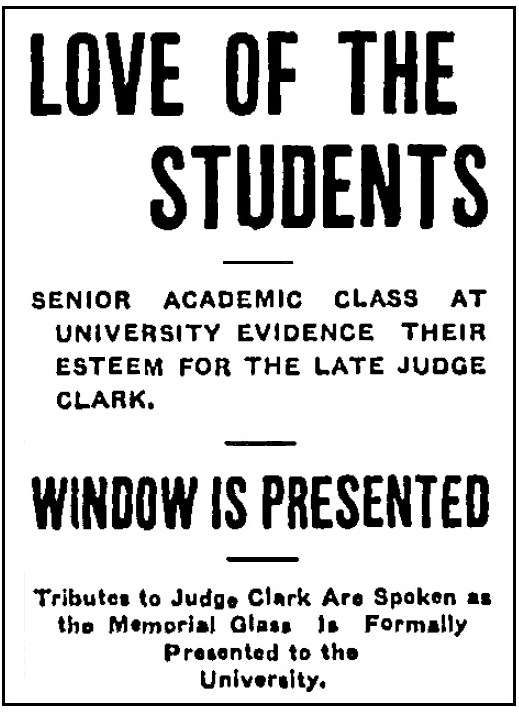 But the University faculty took a dim view of the cowbell, thought it an unworthy instrument to rouse young college scholars, and at the start of the 1911 academic year had electronic chimes installed as a “more dignified method.” While this eliminated the need for the crude cowbell, the musical chimes turned out to be less than effective on slumbering students, who constantly had to pass up on breakfast in order to make it to their 9 a.m. lectures. Bong! Bong! Bong! Bong! The morning quiet was abruptly interrupted at the usual 6:45 a.m., but not by a sound usually heard in the hall. A fire alarm? Startled residents rose from their beds and hustled outside to investigate. The noise came from the top of the building. As they peered up to the roof, they discovered a 30-inch brass bell, installed in a makeshift belfry in front of the community room on the fourth floor. How it arrived and who delivered it was a mystery, but the dorm’s inmates weren’t about to let such a gift go to waste. After a noontime Thanksgiving Day dinner, which was universally praised as the “best ever served in the hall,” the 120 residents gathered upstairs for a proper bell dedication. Junior law student Teddy Reese, who was also UT’s head yell leader, provided the oratory, described the history of the cowbells used in the past, dwelled on the failure of the electric chimes to serve their purpose, and expressed the “heartfelt and sincere thanks that is in the bosoms of all B. Hallers for the modest and benevolent donor of the bell, whomever it may be.” Katherine Smith, only the second woman to serve as the hall’s steward, officially christened the bell. 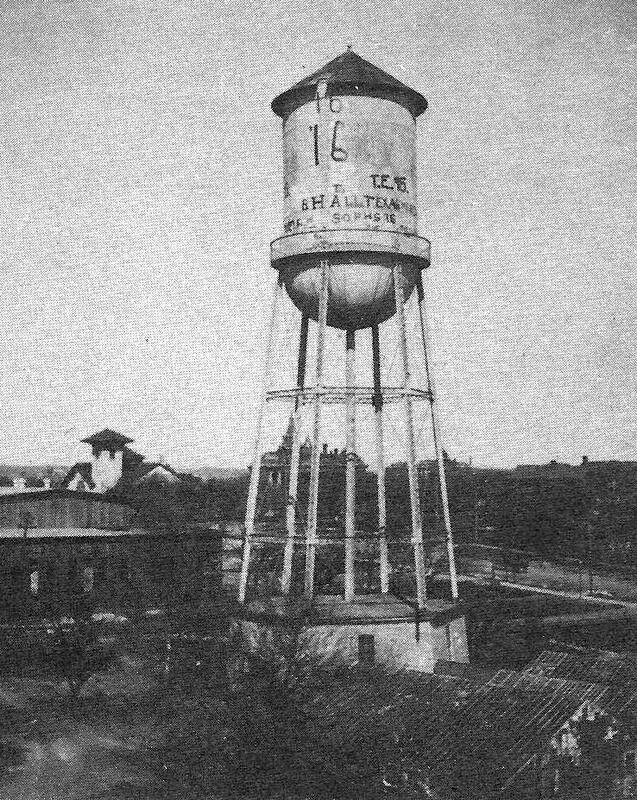 “There not being any champagne at hand,” reported The Austin Statesman, “the ‘Belle’ christened the ‘bell’ with a bottle of good old Adam’s ale.” The bell was immediately put to use. Some of the residents of B. Hall in a 1911 group portrait. 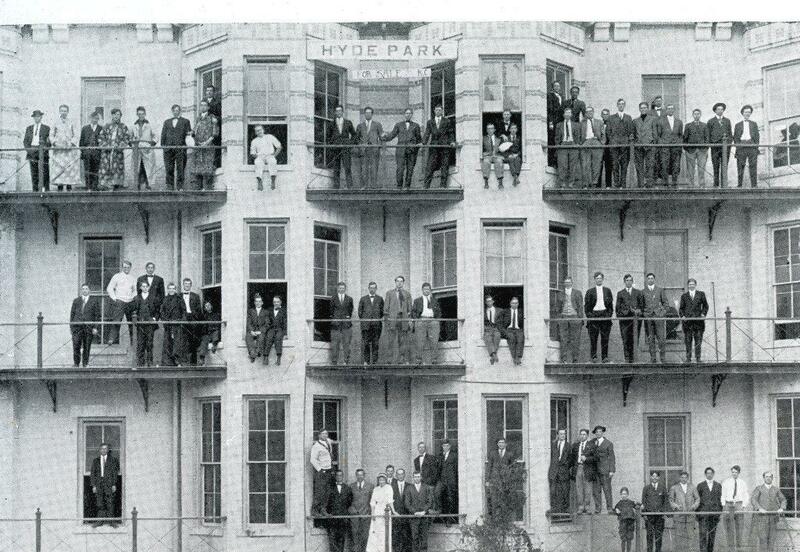 Hall steward Katherine Smith is standing on the first floor, center, in the white dress. In a remarkable coincidence, just as the unexpected bell arrived at B. Hall, a similar bell disappeared from the Fulmore School in South Austin. 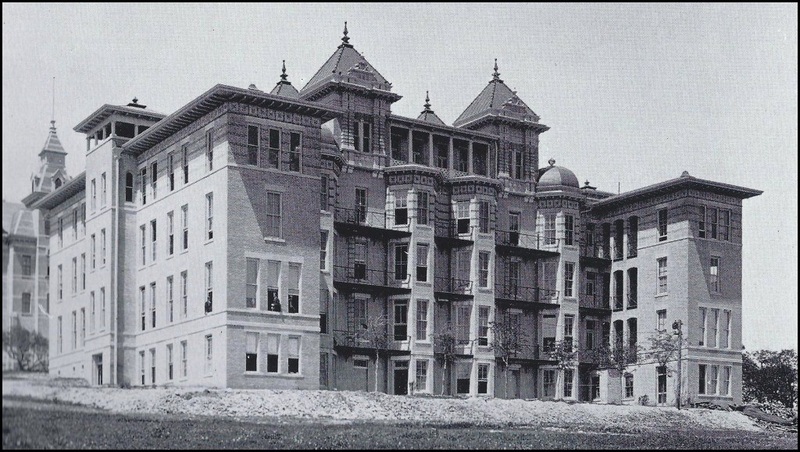 Opened in 1886, the Fulmore School was initially housed in a whitewashed, wooden, one-room structure just off South Congress Avenue. Austin resident Charles Newning presented the school with a bell in the early 1890s. A prized possession, the bell was rung a half hour before classes began every morning, and again as school ended for the day, so that parents knew their children would soon return home. Its familiar peal had been a part of the neighborhood culture for decades. 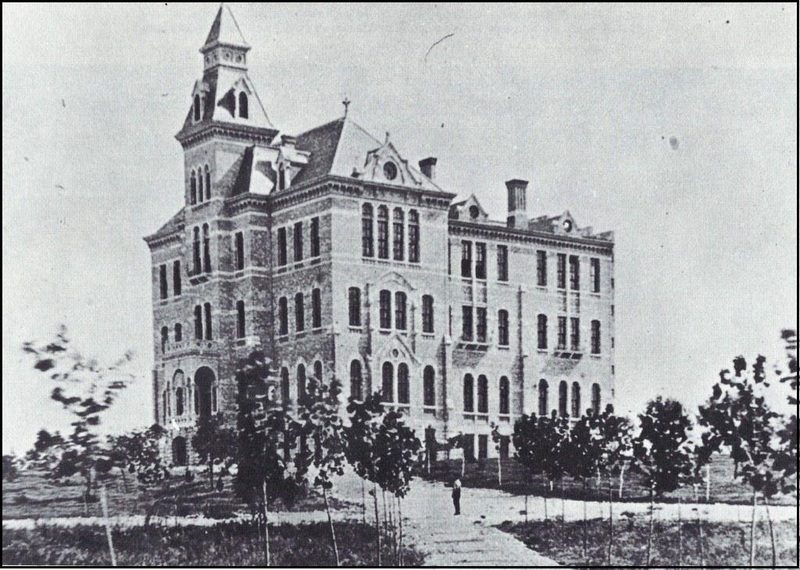 Early in 1911, the Austin School Board elected to build a new brick building for the Fulmore School, two blocks south of its original location. It was completed over the summer and formally dedicated on November 17, just two weeks before Thanksgiving. A short wooden bell tower, which looked something like a miniature oil rig, was constructed for the old bell, but it hadn’t yet been installed before the bell disappeared. The Fulmore School in the 1930s. The building was completed in 1911, with a wooden bell tower (and brass bell) to the right. 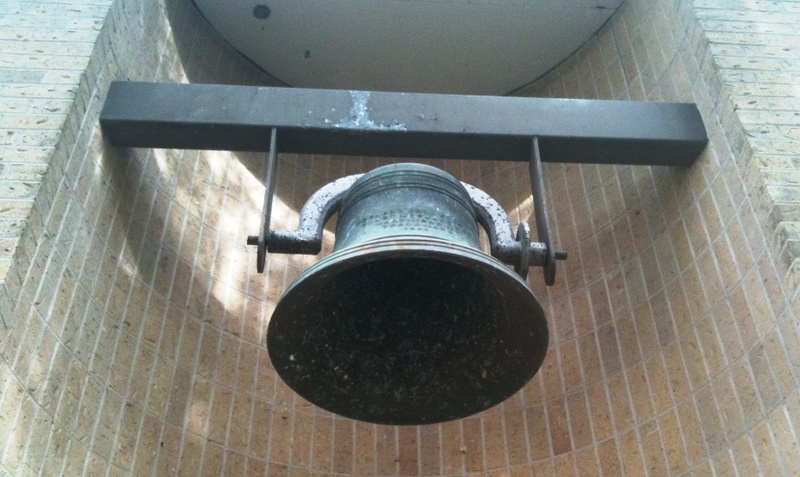 As news of B. Hall’s good fortune spread to South Austin, the custodian of the Fulmore School began to wonder if the hall’s newly acquired bell, and the school’s missing bell, might just be one and the same. In the middle of the afternoon on Thursday, December 7, while most of the hall’s residents were in class, the custodian ventured to the UT campus and took an unwise risk. He entered B. Hall alone, quietly crept up the stairs to the belfry, and tried to examine the bell, which sported a fresh coat of red paint to disguise its former appearance. But the intruder was soon discovered, the bell rung in alarm, and B. Hallers sprinted from all parts of the campus to defend their home. According to accounts, one resident giving a speech in his law class heard the bell, abruptly stopped talking, and dashed from the classroom with no explanation. An engineering student was in the middle of a calculus problem at the chalkboard when the bell sounded. He muttered an apology to his professor – engineering dean Thomas Taylor – then jumped out of the first floor open window and hurried to the hall. Before the frightened custodian could make his exit, he was surrounded by a vocal mob of B. Hallers and doused repeatedly with so many buckets of cold water that he later remarked he’d had his bath for the week. But while the bell hadn’t been visibly identified, its familiar sound was unmistakable. 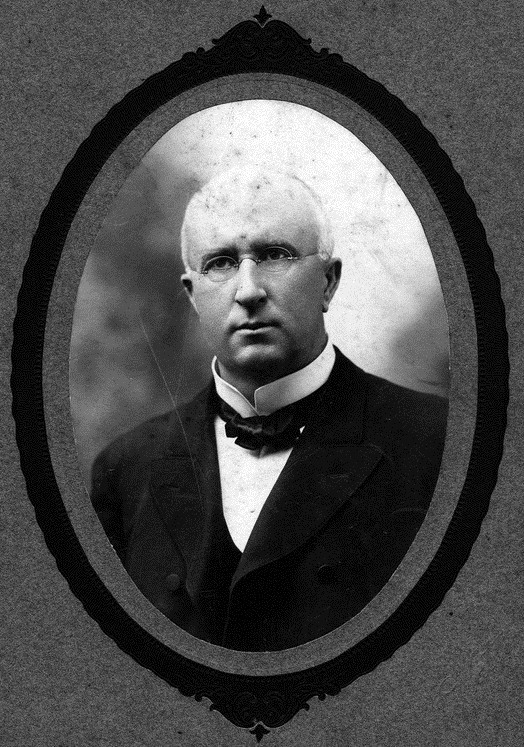 A week later, Dr. Harry Benedict, then serving as Dean of the University (what would today be called the “Provost”), received a letter from Arthur McCallum, the Austin school superintendent. 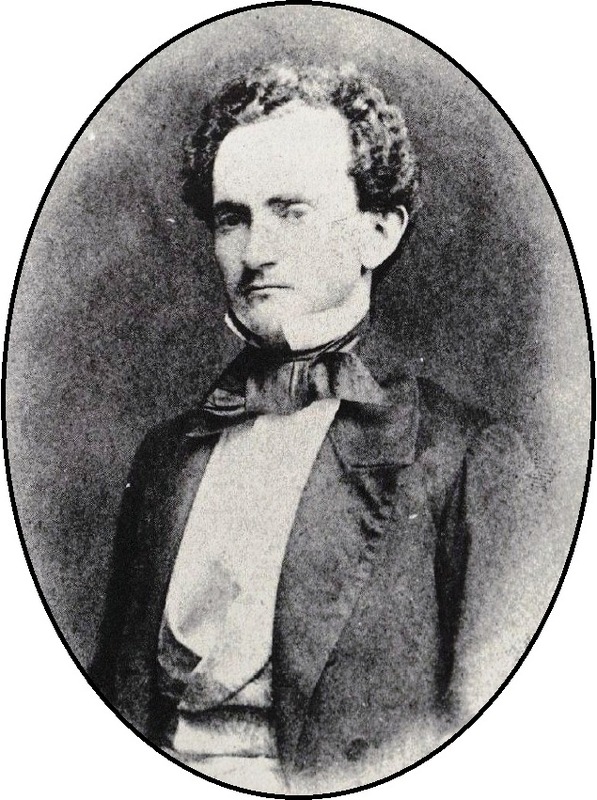 “At a meeting of the school board yesterday afternoon,” wrote McCallum, “I was instructed to ask that the Bell which someone took recently from the South Austin school be replaced or put where someone can get the bell without suffering the humiliation of being watered.” McCallum explained that the bell had “summoned the children of that community to school for a long-long time, and I believe that the people of South Austin are more attached to the bell than the boys of B. Hall.” Certainly the custodian missed the bell, as he had been forced to improvise and use a cowbell of his own to call the children to school. Benedict, himself a UT graduate and a former resident of the dorm, passed the note along to B. Hall steward Katherine Smith. The fall ended with the bell secure in its B. Hall roost. It continued to be employed through the new year and into a chilly January, which included a rare, mid-month snowstorm. But as time wore on, the novelty of the bell waned, and “some embryonic reformer” began to urge his fellow residents that it was time to return the item to its true owner. 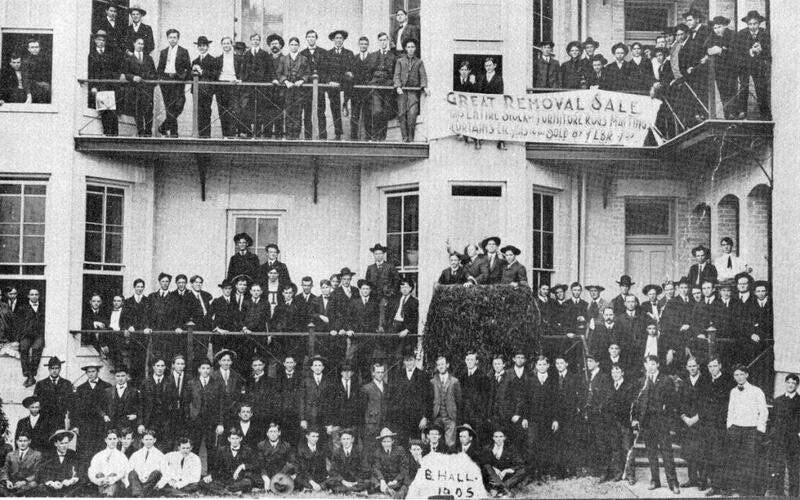 As related in the Cactus yearbook, “So well did this Luther preach that ere long he had converted enough to make the project possible.” Since no one was willing to admit to kidnapping the bell, residents had to come up with a creative solution that would preserve B. Hall’s dignity. Crossing the new Congress Avenue Bridge, B. Hallers return the Fulmore School bell atop a horse-drawn flat wagon on February 4, 1912. Clangity-clang! Clangity-clang! The following Saturday afternoon of February 4, amid brief snow flurries, shoppers along Congress Avenue were amused by the ridiculous sight of a horse-drawn flat wagon loaded with about 20 residents of B. Hall, all dressed in various garb. One incessantly rang a bright red bell, and two others, one with a barrel and wooden pole, and other with a tuba, provided musical accompaniment. The sight and noise attracted nearly a hundred local school children, who followed along on foot or rode bicycles. At each street corner downtown, the wagon stopped and yell leader Teddy Reese led the group in “Fifteen Rahs” for the bell. The wagon continued across the bridge, over the Colorado River, and on to South Austin and the Fulmore School, which was three miles south of the University campus. Upon arrival, and with much fanfare, pomp, and ceremony, the bell was presented to the school’s custodian, who graciously accepted the gift. A century later, the bell still proudly resides at the Fulmore Middle School, minus its coat of red paint. 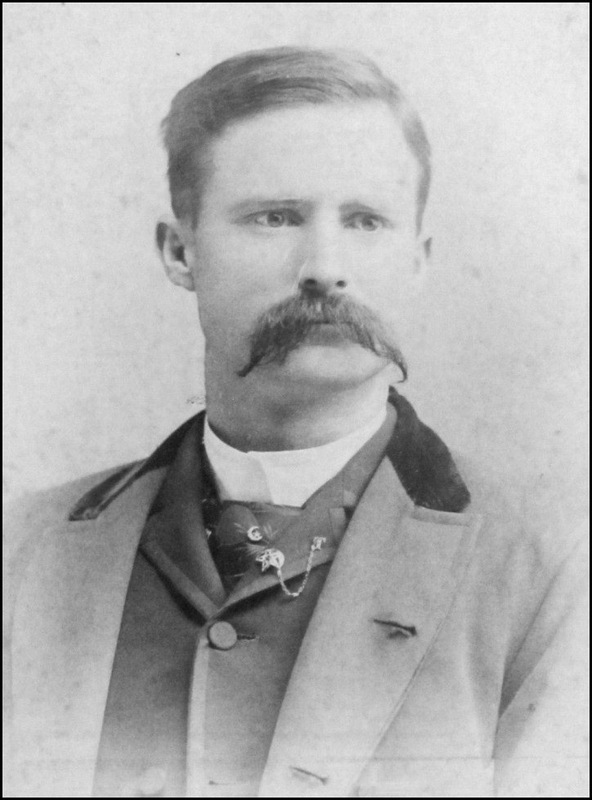 A few years after the incident (and, perhaps, after a statute of limitations had expired), Teddy Reese confessed to instigating the bell’s capture. In 1910, a new Congress Avenue Bridge was constructed to replace the older, unsteady pontoon bridge that once crossed the Colorado. 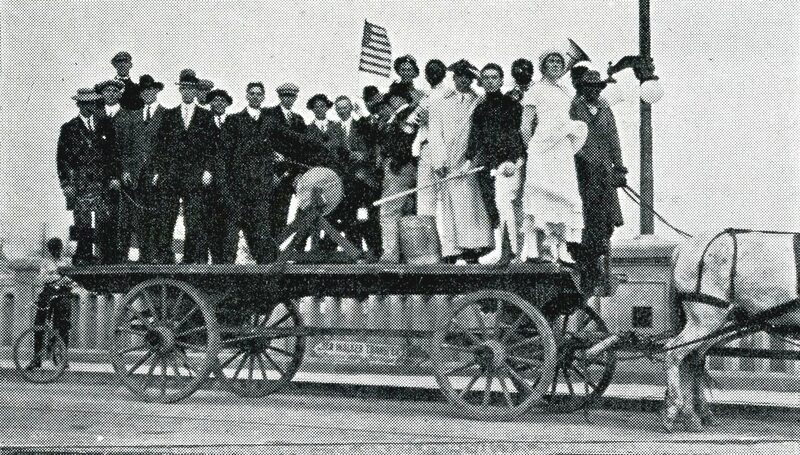 A year later, the city’s electric trolleys extended a line across the bridge and into South Austin, and UT students began to take their dates on the trolleys to the south side for afternoon walks. The weekend before Thanksgiving, Teddy and his date spied the Fulmore School bell on the ground next to the new building, and Teddy decided that it would make an excellent alternative to the chimes used in the hall. Teddy approached his best friend in the dorm, Walter Hunnicutt (who would later compose “Texas Taps,” better known as the Texas Fight song), and together they recruited a crew of about 10 persons, all sworn to secrecy. In the late night hours before Thanksgiving, the group paid the B. Hall chef to borrow his horse and delivery wagon, went to the Fulmore School, carefully loaded the 300-pound bell so it wouldn’t ring, then returned to campus and quietly hauled the bell upstairs, where it was rung at the break of dawn. Having returned the brass bell, the trusty cowbell was once again heard in B. Hall.